"Bass’s multidimensional view of Africa is a refreshing change from the traditional travelogue. Writing in a lucid and introspective style, he combines a unique perception of Africa’s past, present, and future. 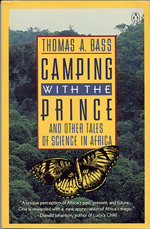 After reading Camping with the Prince, one is rewarded with a new appreciation of Africa’s magic." "Bass overwhelmingly fulfills his intention to convey the incredible richness Africa offers the inquiring mind. He explores the continent with impeccable research, enthusiasm, wry humor, and unsentimental humanity. Beautifully written, this is quite simply the best book on the subject since Rene Dumont’s False Start in Africa." "The Prince of the title was only a tourist, but the African scientists Thomas Bass visits for us are a royally enjoyable lot, humans seized with extraordinary puzzles and with the wit and hope to work on them. The book is a one-of-a-kind." — Phillip Morrision, author of PBS series "The Ring of Truth"
"Lively and very readable accounts of some ongoing scientific projects in present day Africa. Background descriptions and character sketches of the people involved will convey vivid pictures of the conditions under which these projects are being carried out, even to readers unfamiliar with Africa." "I thoroughly enjoyed camping with Bass. His angle on Africa is ecological and scientific, and told me many things I hadn’t known before: as witty as it’s wise, as readable as it’s realistic—a book at the top of a difficult class. Strongly recommended." — Basil Davidson, author of Can Africa Survive? "Read Thomas Bass’s seminal book.... It not only gives reasons for not despairing of Africa; it suggests why it is in our self-interest to help a continent in crisis." "[Bass] succeeds admirably at providing a refreshing antidote to the news media’s bleak portrayal of contemporary black Africa. While he does detail some of the appalling failures of Western aid and development programs, Mr. Bass makes a strong case for the limitless scientific possibilities of the continent, and for the adventurous scientists who frequently risk their lives for the ‘something new’ that always comes out of Africa." "One of the refreshing strengths Bass brings to what I suspect was a labor of love is that his real heroes are Africans: bright, educated, dedicated and optimistic.... His optimism is based not on the proximity of solutions but on the fact that a new generation of post-colonial Africans—scientists and others—are taking the lead in grappling with the problems that control their destiny." "Richly informative on the African environment, health, agriculture, and social life, the book depicts these various endeavors partly through the commanding personalities of the African and Western scientists who created them." "Bass’s stories highlight the often disastrous effects of ignoring local knowledge and practices." "Bass’s book is not simply science writing. Like the researchers with whom he journeys, Bass has learned the effectiveness of combined interests. The result is a tangy verbal concoction: one part science, one part travel, two parts bemused, yet impassioned observation." "Bass’s theme is the need for science to grow African roots rather than transplanting Western assumptions, a process that is full of surprises and new insights."